You can purchase small plastic toys online, from the dollar store, or the toy section of your local target or walmart type store. This technique should work with any type of plastic toy… you could use zoo animals, cars… whatever! Medium/large toys work well for Christmas ornaments, the small/mini ones are great for wreaths. Just be careful because the hot glue gun puts out molten lava like glue… it’s hot and it will really HURT if you get some on your fingers! Also, make sure you do this in a well ventilated area (outside is best), because the plastic and the spray paint will give off some potentially hazardous vapors. 2. Once you have inserted the hooks, take your toys outside and set on top of some newspaper or parchment. (I did this outside on a non-windy day). 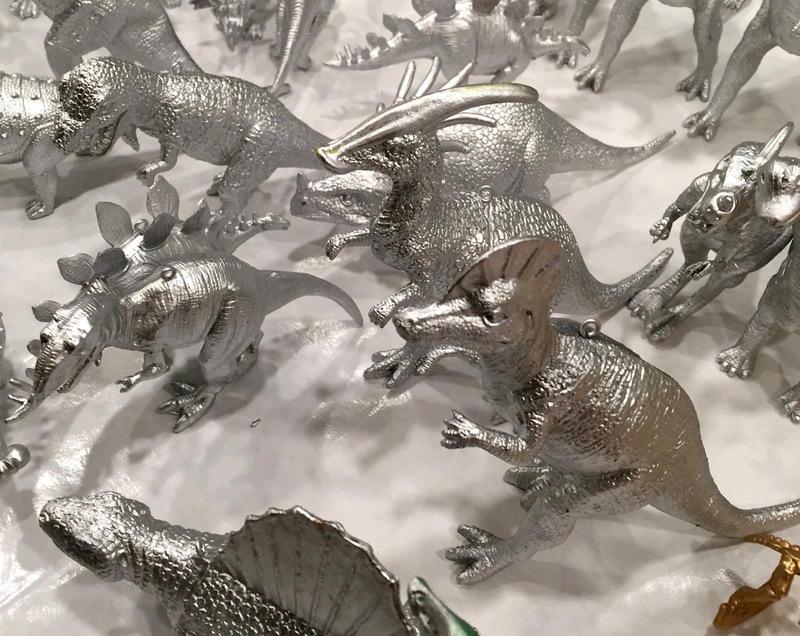 Spread the dinosaurs out individually (so that they are not overlapping), then spray with your first coat of spray paint. 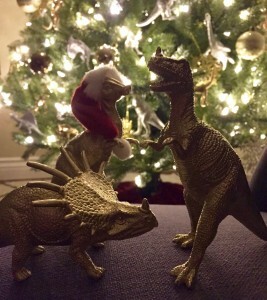 Once dry, flip your dinosaurs and coat the other side. When dry, check to make sure you got all the nooks and crannies, and touch up any unpainted spots if needed. I used both gold and silver spray paint. 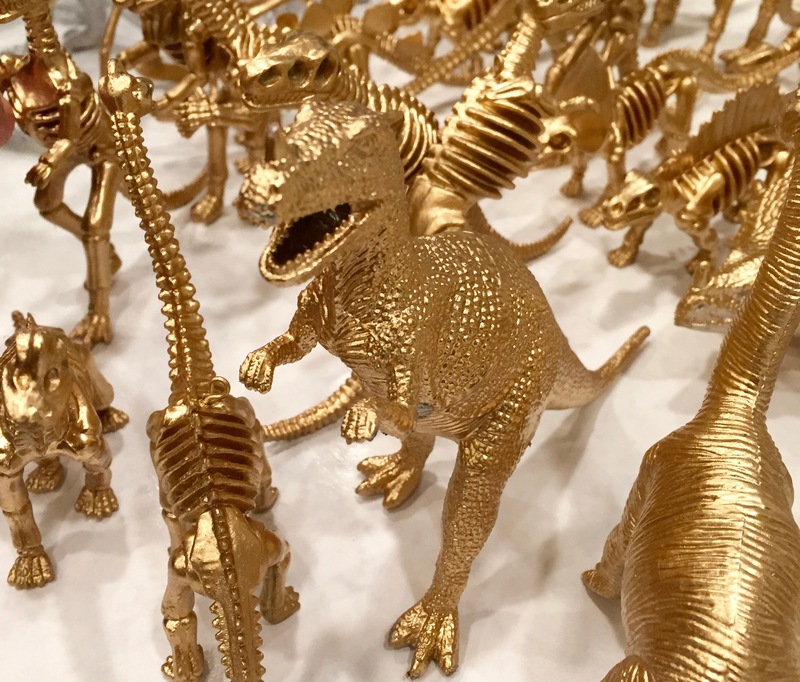 If you aren’t using Krylon Metallic Spray Paint, make sure you go with a brand of spray paint that can be used on plastic. I purchased the Krylon from a craft store (Michael’s), but you can also buy this type of spray paint online, or from a hardware store. 4. 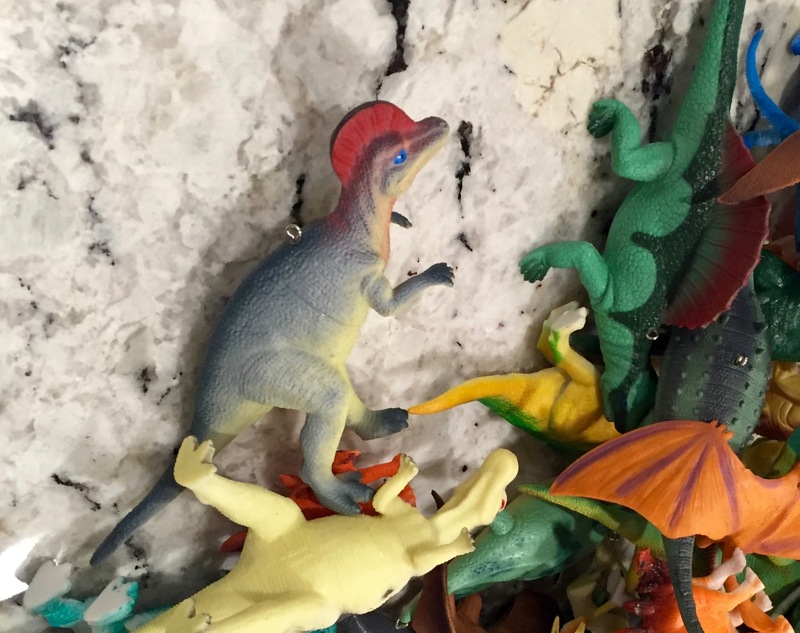 Dinosaur Wreath: Purchase small/mini plastic dinosaur toys. 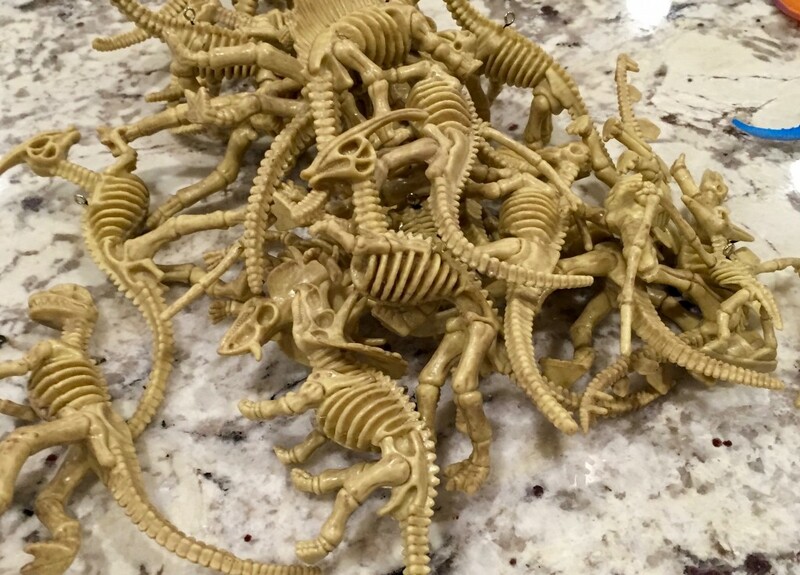 (These were about $13 for a bag of 96 pieces, approximately 2″ in length – about the same size and quality of little green army men.) Lay a wreath form on top of some newspaper or parchment. (If you don’t have a wreath form, you can do what I did and just unravel and bend a metal coat hanger into a ring shape.) 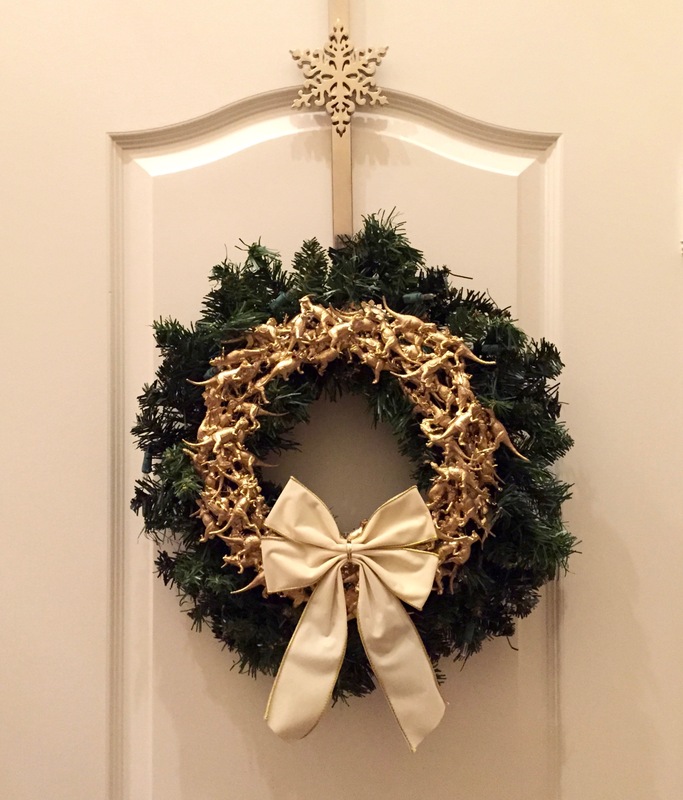 How big should your wreath form be? 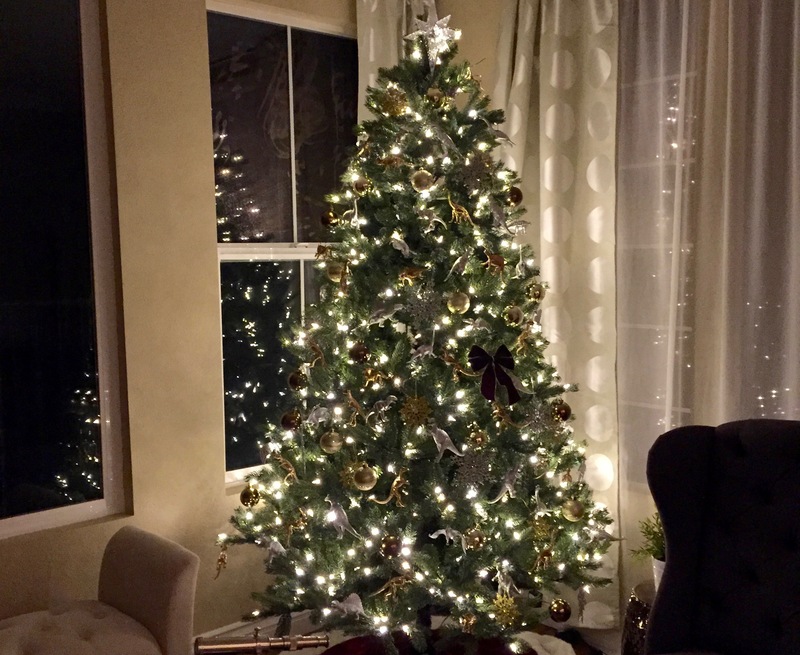 Whatever size you choose, just make sure it is slightly smaller than your Evergreen wreath (see the size difference in step 5 below). 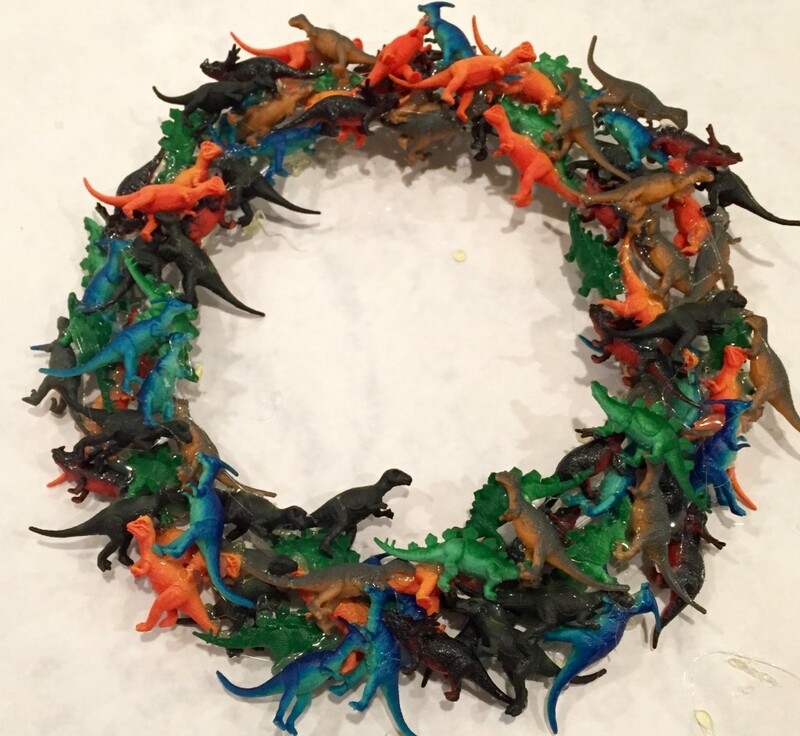 Using your hot glue gun, attach the small plastic dinosaurs around the diameter of the wreath form. (Allow the glue to cool and harden as you go, so that the layers don’t fall apart.) Eventually you will want to start overlapping the dinosaur layers so that the entire wreath has structure and stays together. 5. 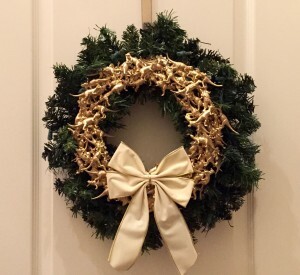 As in Step 2 above, take your cooled and hardened wreath outside and spray paint from various angles in the metallic color you prefer (I liked gold) using the Krylon spray paint. Once the paint is dry, use wire or small zip ties to secure the plastic wreath on top of a plain evergreen wreath. 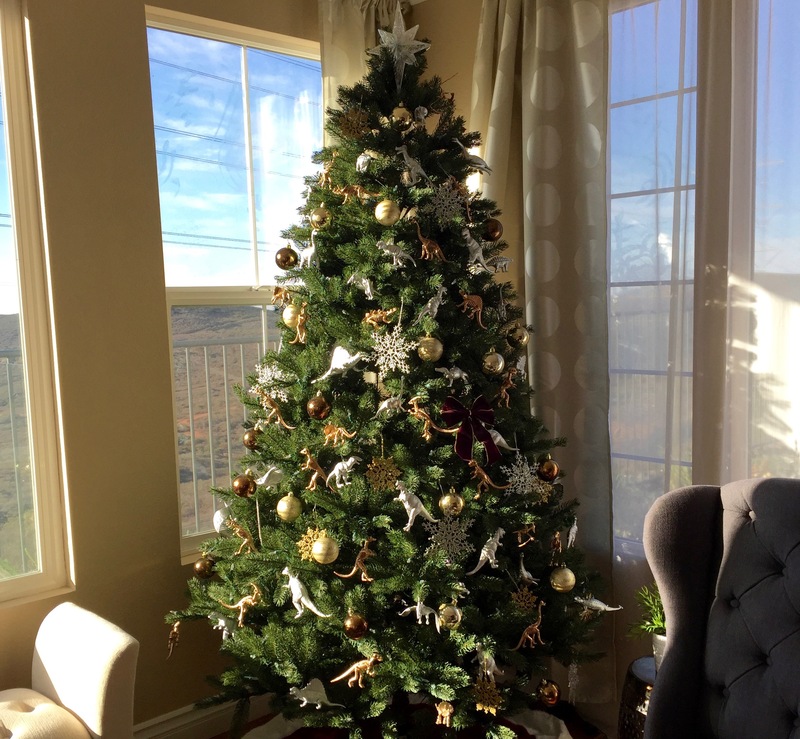 Decorate with a nice bow or ribbons, then hang! 6. 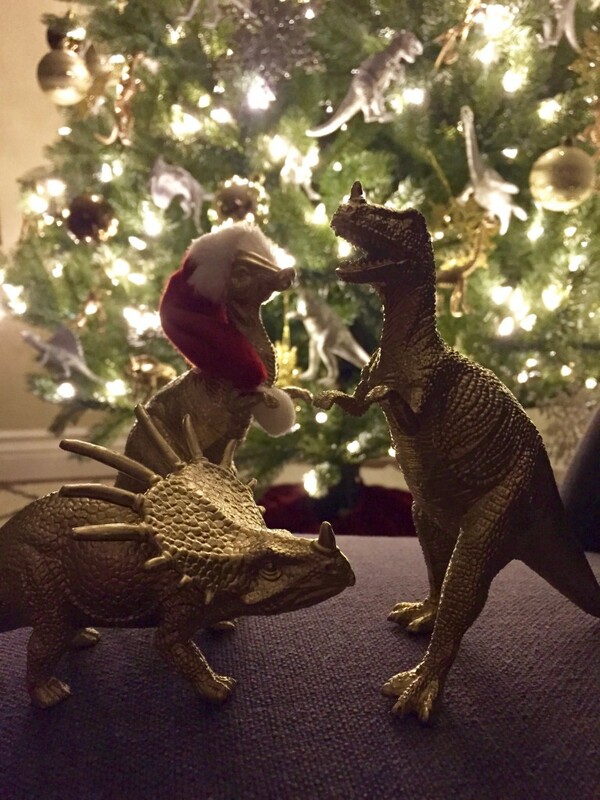 Enjoy your dinosaur themed Christmas decor!